As I watched Larry King yesterday night, he kept asking this same question to all his guests: What does the inauguration mean to you? I have been trying to answer that question this morning. As a black person living in the United States at this time, it is imperative to find an answer to this question. Yet I seem numb and find it a daunting task to come up with something profound. I am trying not to wrap my answers in clichés gleaned from TV news casters and talk show hosts. I am trying to reach into my soul to feel the answer. Yet after a full night sleep on this, my take is another hackneyed premise: Once more the black man has proven that given the chance, he/she can perform as good as any one if not better. But it may be that the mammoth nature of this occurrence is so overwhelming that only tested phrases can encapsulate one’s thoughts. Nonetheless, slithering from this rather blanket statement- this inauguration certainly holds potential for my two boys born in the United States. 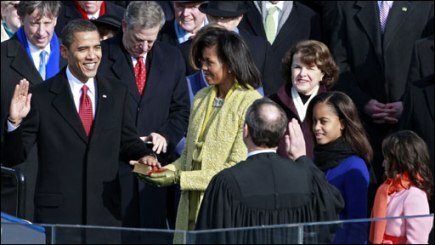 President Barack Obama then becomes a personification of reachable ideals and a metaphor for potential. There may no longer be a need to change African or non-western names to make them suitable for white audiences, for if a Barack Hussein Obama can be made president in the USA especially when another Hussein was hung in a not so distant past with the USA as star witness, then all is possible. Also, that Barack Obama is the product of a single parent home is no longer news but it is a fact that sits in a privileged corner of my single parenting soul. It is a fact that forces me to connect to Anne Soetoro, Obama’s mom, Debbie Phelps, and Donda West. All moms who have single handedly raised super inspiring men. So I look at the inauguration day, and I see the finishing line of an Olympic game of hurdles and Barack Obama as an outstanding gold medalist. The missing coach is of course, Mama Anne Soetoro. So I guess there’s no chance for me to say anything more profound than this: The inauguration of the first black president of the United States of America captures hope, inspires hope, displays hope, engenders hope, facilitates hope, and creates hope. I don’t know about you but my two sons and I are ready to fly on the wings of hope to Obamaland where hope gives birth to reality in the superlative.